You have a fat tummy! Grandma, look at Crampa's fat tummy. I have a good family, grandma. I have you, Crampa, mommy, and Rex. It is a good family. I'm glad that he seems to be happy about that. Isaiah said the he and Crampa are the Two Mustateers. I can't be one because I'm a girl. Who wants to be a "Mustateer" anyway? Isaiah loves to play pretend. He loves the characters in Backyardigans, The Power Puff Girls, the Ice Age movies, and Monsters vs. Aliens. I “get” to be Tasha from Backyardigans. 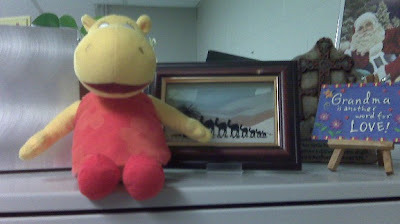 With that in mind, he sent his Tasha stuffed animal to work with me. It now has a place of honor on top of my overhead bin. He said that Tasha needed to keep me company, so there she sits as a constant reminder to his vivid imagination. Last night, Isaiah was sitting on the floor in front of Ron and I realized he was singing. That's not so unusual because Isaiah sings a lot. He sings made-up songs, songs from church, songs from school, and now he's singing songs he's learning at the Y during day camp. The unusual part is that he was singing Hush Little Baby to Maisey and was rocking her back and forth. I hurried to get my phone so I could take a picture but it didn't turn out too well. If that mocking bird won't "seen"
Isaiah's gonna buy you a diamond "reen"
He's such a cutie. I love to hear him sing. He's full of joy and is so fun to watch. Isaiah has a Star Wars Wii game, which he loves to play. He mostly likes to watch the good guy jump up and down. I don't know how far he ever gets in this game because I try not to be close enough to actually hear too much of it. Last night, he wanted me to be on his "team" and play it with him. Me: I don't know how to play that game and I don't want to learn. Isaiah: Crampa, will you be on my team and play with me? Ron: I'm watching you play from here. My hands can't work the controls. Isaiah: Please Crampa... I can show you how. Ron: OK, I'll come play and be on your team. Isaiah: Oh, I SO love you Crampa! Isaiah was very happy to share his controls with his "Crampa" and play the game. Isaiah and Amy went to the grocery store today. He "bought" watermelon for dinner. He decided that Crampa and I needed to have watermelon. Actually, he decided that he and Crampa needed watermelon. I could have some, too if I wanted it. He wanted to eat his watermelon first but I told him he had to eat his dinner first. Isaiah: Watermelon is for dinner. Me: It's for after dinner. It's almost like dessert. Isaiah: I like to do it my way. Me: I know you like to do it your way, but we're going to do it my way instead. Isaiah: So I have to eat my dinner first and then have watermelon? Isaiah: OK, I guess. But next time can we do it my way? I didn't answer that question. He wants watermelon in his cold lunch for day camp. I said I'd put it in a container and he needed to bring the container home. He wanted me to just put it in a baggie. He thinks you can put anything in a baggie. Technically, I guess you can. It just depends on how big of a mess you want to clean up. Got Isaiah home from daycare and in less than five minutes he had stripped down to his shirt and underwear. He leaves a trail of clothes from the bathroom to where he's sitting - a shoe here, a sock there, another shoe, another sock, and finally - his shorts. Me: Isaiah, where are your shorts? Isaiah: Grandma, I told you yesterday I don't need them so I took them off. I'm not going anywhere. Me: No, you did not tell me "yesterday" that you were taking them off. You can't sit around naked. Isaiah: But Grandma, I not naked; I have on my shirt and unnerwear. I don't need shorts. I'm not going anywhere so I can just wear my unnerwear and shirt. I think it must be inbred in boys to take off their clothes and sit around in their underwear. I don't think they outgrow it, either. The other night when I picked Isaiah up from daycare, I asked him what he would like for supper. He wanted green eggs and ham. The green eggs I could do, but I didn't have anything in the house that I could pass off as ham. I suggested waffles and pancakes, which he vetoed. I suggested McDonald's and he thought that would work. Me: You can have chicken nuggets or a hamburger. I'll get you fries and a Sprite. Isaiah: What about a Happy Meal? Me: I will get you all of the food that comes in a Happy Meal but I'm not buying the meal. Me: Because it's a waste of money. The toys are just junk. Isaiah: (slaps hands down on car seat armrests and I hear his feet hit the seat) What!!!???!!! (enunciating every sound and syllable) W-h-e-n d-i-d t-h-a-t h-a-p-p-e-n!???!!?? The toys are JUNK!!! Who took them and made them junk? Oh no! Now I'll never get to play with them! Somefeen should be done about that! Who do we tell? We need to tell someone. Me: There's no one to tell. They've always been junk. The kid has a career on stage or in theater. Isaiah had an accident. Not an "accident" but an "accident" - as in waiting too long to go to the bathroom. Why is it that boys do this? I'm sure girls probably do, too but it seems to be more prevalent in boys. By the time he got into the bathroom, he couldn't get his pants down. Ron saw him in the bedroom in just his underwear. Ron: Where are your pants? Isaiah: I took them off. Isaiah: Oh, I wet them. It was an accident. I dinnit mean to. Ron: Could you not get them unfastened? Isaiah: No, I just waited too long. When Amy found out he'd waited too long she made him change and then go sit in time out. He was not a happy camper with that development. 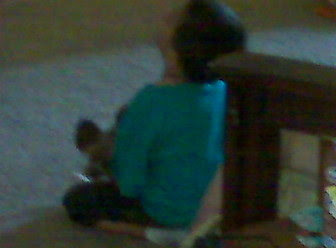 Once he was allowed to get up he told me that mommy had hurt his feelings because she made him sit in time out. I told him that he sat in time out because he had wet his pants, and if his feelings were hurt it was because he got punished. At dinnertime, I told him to sit down next to Grandpa at the table. He wanted me to sit on the other side of him. "I can't sit next to mommy because she hurt my feelings. I can only sit next to you and to Crampa." I guess he thought he was punishing her by not sitting next to her. 1. "I'm sorry, Grandma. It was an accident." You're just sorry because you got caught. "No I not. I dinnit get caught in a net." 3. "If I eat too much, I'll turn into it. If I drink too much water, I'll turn into water. So I will just share yours. I love to share. It makes me happy." Probably because you're sharing *my* water.